You have a respectable game of golf that comes and goes, just like the rest of us, but even on those days that you seem to hit the ball better, your score seems to be the same. How do you get those scores lower and, ultimately, have more fun? Take responsibility for your score and improve your short game. By identifying your strengths and weaknesses and applying simple methods for quick skill improvement you can manage your own game and lower you scores. 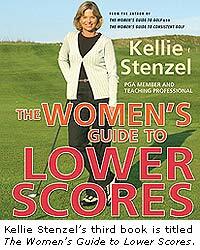 Also, with better shot selection and a short game 'cheat sheet' you can hit less than perfect golf shots that will still be fine and help to lower your scores without necessarily improving your skills. 1. Identify your strengths and weaknesses by taking notes during your play. In order to lower your score you must first determine what areas of your game need the most work. As you play your rounds, make small notes on the side of your scorecard. If there are recurring problems these are the areas you should focus your practice. 2. Learn to putt and control your distance. Becoming a good putter requires a good set up and a few basic fundamentals. Once you bend forward from your hips so that your eyes are over your golf ball and your hands hang directly below your shoulders, you will be able to isolate your upper body and make a proper putting stroke where only the triangle formed by your arms moves. Next, you have to practice to learn to control distance. Any spare time you can find to practice stroking medium to longer putts to learn to control your speed and distance will automatically help to lower your scores. 3. Putt whenever you can. There are a lot more times when you can putt and might not realize it. Other than putting from the green you can also putt from the fringe or collar, up closely mown hills, from farther away from the green in short manicured grass or just into the rough, greenside. Because there are very few moving parts when you putt and the ball generally does not get into the air, it is a very low maintenance choice and therefore more forgiving and consistent. 4. Become a good chipper. Other than putting, chipping is the lowest risk shot. Once your set up is proper, gripping low, stance narrow, weight and shaft of the club leaning forward, the stroke is just like that of putting. Because the stroke is relatively small, you are more likely to be more consistent and any miss will be less penalizing. 5. Only pitch the ball when you have to. When you are in a short game situation where you need more carry in the air than there is room for the ball to roll, you will have to pitch with your sand wedge. Because a larger swing will be necessary to carry the ball a greater distance in the air, this shot will be riskier and should only be used when you have ruled out all other options.